LAWN product specialists DJ Turfcare have teamed up with Classic-Lawns.co.uk to bring gardeners major discounts on two of the world’s most popular lawn edgers. 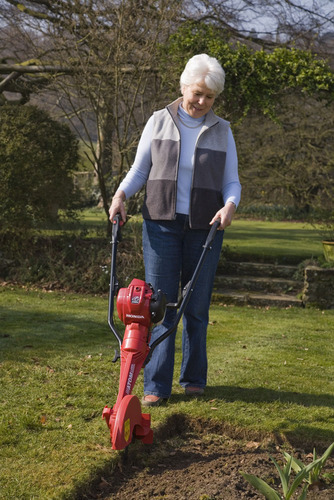 Atom Lawn Edgers have been winning fans across the world for years – and have saved gardeners from the hell of “lawn edging backache”, a familiar complaint in doctor’s surgeries at this time of year. Now the two most popular Atom Edger models, the Komatsu two-stroke, and the Deluxe Honda four-stroke, have been reduced in price for on-line customers. The standard Komatsu model is normally £300 (inc VAT) but has been reduced to £249 (inc VAT) for on-line orders. The Deluxe Honda model has been reduced from £350 to £287 (inc VAT) – a significant saving, reflecting the number of people now buying their garden equipment through the internet. “These massive savings can be made because of the on-line deals we are able to offer together with Classic Lawns,” said David Jenkins, managing director of DJ Turfcare, sole UK distributors for the Atom Lawn Edgers, which are manufactured in Australia. The big advantage of Atom Edgers is that they work on a metal blade system – no fiddly plastic cable to replace . . . and making the half-moon edging tool obsolete. THE ATOM LAWN EDGER from DJ Turfcare is designed to take the backache out of edging for gardeners. Manufactured to a very high standard in Australia, the Atom Lawn Edger has won several awards and is probably the largest selling lawn edger worldwide. Light, easy and simple to use, the Atom Edger cuts round all shapes of flowerbeds and borders, quickly cleanly and accurately – and is ideal for cutting new edges into established lawns. A patented four-blade cutting system creates a crisp neat edge to lawns with long-life blades made from hardened spring steel that do not need sharpening. With comfortable bio-rubber grips and strong steel handles, the Atom Lawn Edger has a safety throttle interlock with half throttle lock for easy starting and a fingertip on-off ignition switch. A large rubber-tyred six-inch (150mm) wheel makes steering easy while a large fully-enclosed blade guard ensures safety. Six-position depth control means users can easily determine how deep blades cut, ensuring that grass roots in borders are severed. The fully-enclosed solid steel precision-ground transmission shaft and heavy-duty automatic clutch are housed in reinforced super-strength polyamix casing. Lightweight and easy to handle, the Atom Lawn Edger comes in two models – one with a Komatsu two-stroke 26cc engine and the Lawn Edger Deluxe with a Honda four-stroke 25cc engine. DETAILS: DJ Turfcare on 01483 200976. This press release was distributed by ResponseSource Press Release Wire on behalf of Oakfield Media in the following categories: Men's Interest, Leisure & Hobbies, Home & Garden, Women's Interest & Beauty, Environment & Nature, for more information visit https://pressreleasewire.responsesource.com/about.